Ultimately, I also suggested a relatively quick fix; simply stop using the term "best practice" and come up with something more appropriate. "Lessons Learned" (learnt?) is a different kettle of fish however. Most organisations have some kind of lessons learned mechanism in place (very often associated with their "Best Practice Repository"!) and in my experience very few of these mechanisms add any real value to the organisation. They are put in place to meet the "requirements" of CMMI, etc. and as is so often the case, fail to even to do this adequately because people fail to understand what the model is really trying to help the organisation achieve. 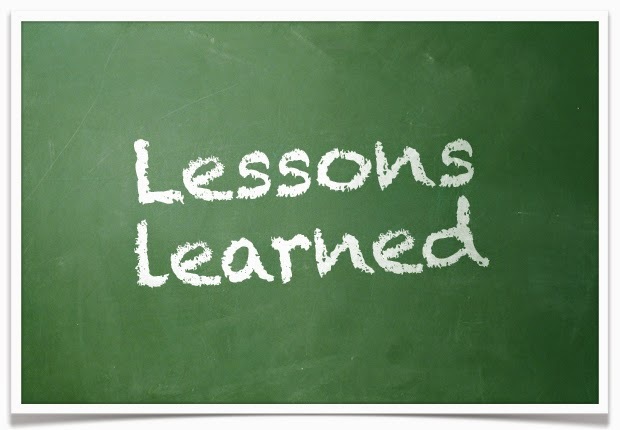 There are a whole bunch of issues associated with the Lessons Learned process, many of which would appear to be associated with the origins of the idea. When I first started working in Software Development over 25 years ago we never did Lessons Learned - but then again, we didn't do much of the stuff commonly considered as integral to the development process today. My first memory of anything resembling the concept of a lessons learned review was when I read an article by Tom deMarco on Project Postmortem Reviews * some time towards the end of the 1990s. This made a lot of sense back in those days - at least in the organisations I worked in where we had a small teams of developers who stayed together and worked on project after project. It made sense in projects that lasted for years, where phase postmortems could be used to identify and correct mistakes prior to starting the next phase. And in the days before I started getting involved in SW-CMM initiatives I introduced the concept and practice into several groups with some small success. There is a management environment that allows the problems to resolved internally within the teams rather than imposing inappropriate solutions on the team without really understanding the underlying issues. Over the years since first reading about the Project Postmortem Process I have been seen numerous lessons learned systems in numerous organisations. Most of them suffer from exacly the same problems. So very often, project lessons learned reviews tell us what we already knew, and probably have known about for some time. And the only thing that future projects can learn is that they are doomed to follow a similar pattern because nothing is being done to correct the organisational issues. The most likely outcome is that new status report and requirements specification templates will be imposed on the projects. In part 2 I'll have a go at look at some of the things we might be able to do to make Lessons Learned a more valuable tool for the organisation, by extracting value for both projects and processes.